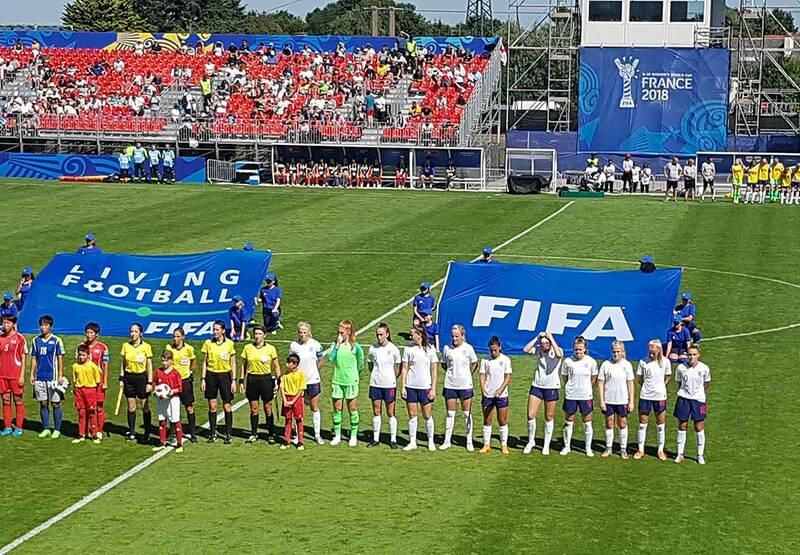 Two goals from University of North Carolina forward Alessia Russo either side of Georgia Stanway’s strike from outside the box saw Mo Marley’s England beat defending Under-20 World Cup champions Korea DPR, 3-1. The result leaves England sitting top of the group and now get set to face a Brazil side who joins Korea DPR on zero points after their surprise defeat to Mexico earlier in the day. Marley went with Sandy MacIver in goal over Manchester City regular Ellie Roebuck while Russo was deployed in a slightly wider position than United States-based fans may be used to seeing her in. Seventeen-year-old Lauren Hemp led the line and was complimented by the quality and hard work of Russo, Stanway, Chloe Kelly, and the midfield duo of Mollie Rouse and Chloe Peplow. England’s performance was commanding if not absolutely perfect, but it didn’t need to be against a team lacking in experience despite their recent history at youth level. With many of the key players from the 2016 Under-17 World Cup-winning side having been fast-tracked to the first team, Korea DPR had two players born in 2002 in their starting eleven, plus several more born in 2001. In contrast, England’s entire squad only has three players born in 2000 with no player born later. But take no credit away from the performance, Marley and her side executed the game plan and were clinical and calm when necessary. “We carried out the game plan, what more can you want from the first game,” said goal scorer Russo, who said pressing their opposition was part of the plan. 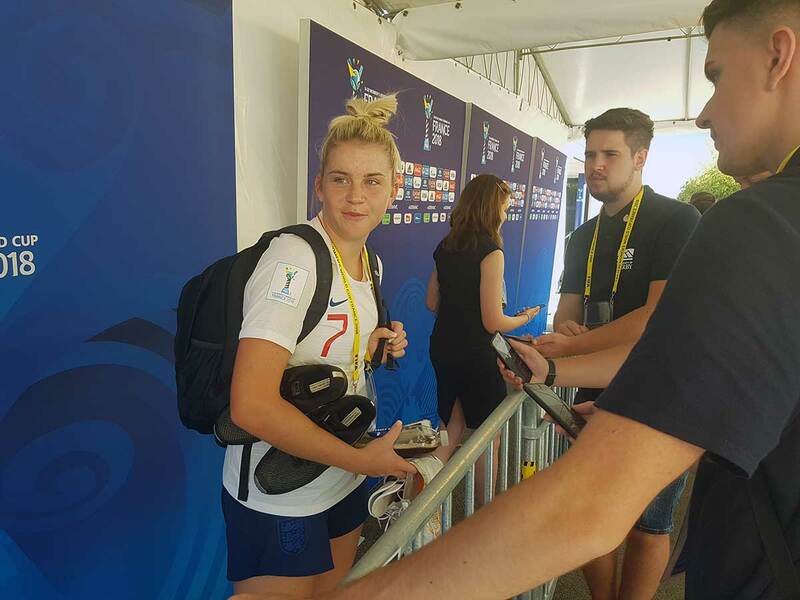 Fellow forward Chloe Kelly also said England executed their game plan throughout the 90 minutes and responded well to a scare from Korea DPR, with the young Lionesses restoring their two-goal cushion less than two minutes after the game went to 2-1. “Going into the game we wanted to start the tournament with no fear,” said the Everton winger. “We wanted to press and I think we got the game plan right today. England’s front four each had a solid game in their own separate right. Russo’s two goals, plus Stanway’s strike were the crucial moments but both caused fits for Korea DPR with their direct movement. Lauren Hemp’s occasional isolation at times up front will potentially give Marley something to think about with the new Manchester City forward venting her frustration at the lack of support in key moments from teammates. But Hemp showed why City was so keen to sign her with incisive running, brilliant footwork, and regularly spinning her marker to run in behind. Kelly was industrial down the left-hand side, both causing Korea DPR issues going forward but always tracking back to help out her defense. In midfield, Chloe Peplow and Mollie Rouse occasionally gave up possession too easily or resorted to hitting it too far in front of the attack and retaining possession will be something England need to work on to go far in the tournament. But from a defensive point of view, the midfield pair were outstanding and crucial in protecting a defense that wasn’t massively tested and stood up well but had their scares when on occasion missing the ball when trying to clear under pressure. Maz Pacheco went off injured during the period Korea DPR scored but fortunately for England it didn’t look too serious with the Reading left back able to walk off without aid from the physios. All in all, it was a deserved win for England in a group well thought of as potentially the closest in the tournament, leaving the players understandably delighted. “We had to dig deep,” said Kelly. “We wanted to go out and showcase our talents today and I think we did that. We didn’t want to concede but it showed the fight in our group to go and score again straightaway. England has given themselves a great chance of progressing into the quarterfinals but Brazil showed glimpses of their quality against Mexico and their defeat won’t blind Marley or her squad into believing Wednesday will be a simple game. Korea DPR did unlock England’s defense and while they didn’t create too many meaningful chances to bother England, the young Lionesses will want and need to be calmer when playing out from the back and less wasteful in passing the ball too far beyond their own attack.